The MxF label will release soon its new second special product called “Let Me.. Sing Again featuring Elvis' Dinner and Midnight show from August 25th, 1973. These recordings are taken directly from a first generation of original tapes. The afternoon show is previously unreleased show, the evening show previously released here is presented in a very improved audio-quality. August 1973, Elvis Is back for his last summer season..The 1973 was begun in the better way, with the Aloha special at least commercial talking…But the things turned immediately toward the wrong direction..the man had too weight to bear in his human shoulders... But as always for Elvis the music keeps his mind alive and overall active..so the best moments of our man is when He is on the stage..The August 1973 is no exception.. The August 25 present Elvis in positive mood , both the shows are solid and well performed...Elvis deliveries some killer version of My Boy and You Gave Me a Mountain, keeping steady part of the show the two classic Suspicious Minds and Bridge Over Troubled Water and delighting the audience with the sensitive The First Time Ever I Saw Your Face and rocker&blues latest single Steamroller Blues. The sound is very good for an ambient recording, We have on our hands the original mono tape of extremely good quality enabling us to carry out a simple re-mastering work, concentrating on the reduction of noise trying to achieve a more clear sound balancing the channel and put at the right speed the tape. The result a pretty dynamic tape with a great definition of the background music and for sure you can live the atmosphere of a Elvis’ concert in the seventy. This is the second product for this label, this new double set will be housed in a deluxe 7”( 20x20 cm ) size digipack, containing a bonus card with a collection of live photographs newspapers clips and memorabilia plus a high quality glossy 135 gram paper poster of 60x20 cm size. In matter to have a special collector item, the 400 copies will be presented with four different sleeves variation. All the copies will come hand numbered sticker and individually sealed and Please remember!! This is a limited hand numbered 400 copies. First 100 copies (variation 1 of sleeve) will be housed in a special Die-Cut&Crucifold sleeve. This deluxe edition will have exclusive contents. 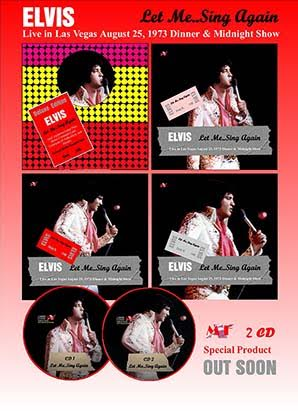 MxF has to be taken with reservations...they are known for just copy available stuff..the show on disc 1 seems new to collectors....I have doubts..my guess is its Aug 24, 1973 DS as released by SA on Rattling Plates as soundbooth recording...the Aug 25, 1973 MS is already available on import anyway..for ages now...be careful..